Built 3,000 years before the miracle of Stonehenge, this is Britain's oldest and best preserved house. The remains of the strongly built shelter, discovered on the Isle of Man, provide a rare window into the domestic life of hunter-gatherers 9,000 years ago. Unearthed by accident during extension work to the island's airport runway, the 23ft wide pit is giving up extraordinary archaeological secrets. Most exciting is the revelation that the people of the mesolithic age, long regarded as nomads who wandered ancient Britain in search of food, were actually very good at settling down. In fact, 12,000 pieces of worked flint, along with a stockpile of tools, show that the homeowners were in residence for long periods at a time. Not to mention the buried mounds of hazelnut shells found around the house - a strong hint of what the ancient inhabitants nibbled for dinner. It is thought the discarded shells were thrown into the fire and then swept out to the edges of the property in an ancient housework ritual. 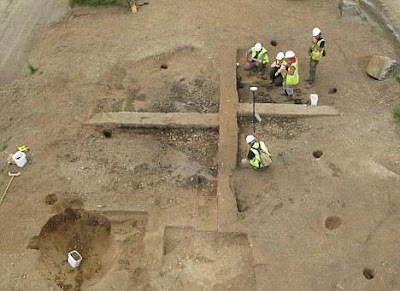 A ring of postholes around the edge of the pit, along with carbonised timbers, suggests the building's supports were about six inches thick and far from a makeshift shelter. Manx National Heritage field archaeologist Andrew Johnson confirmed the building showed that people from this time were settled for long periods. 'The received wisdom is that 8,000 years ago people constantly moved through the landscape as nomads, gathering their food from the land, rather than staying put and farming and harvesting it,' he said. 'But this building was constructed from substantial pieces of timber, and had a hearth for cooking and warmth.